U.S. retail gasoline prices on Monday, September 4, averaged $2.68 per gallon (gal), 28 cents/gal higher than prices a week ago. Supply disruptions and refinery outages caused by Hurricane Harvey continue to affect gasoline supply and prices, particularly along the U.S. East Coast and the Gulf Coast, where gasoline prices are 39 cents/gal and 35 cents/gal higher, respectively, than they were a week ago, before the full effects of the storm were felt. The East Coast, Texas, and parts of the Gulf Coast were the hardest hit by rising gasoline prices in the wake of Hurricane Harvey. Gasoline prices in the Lower Atlantic region increased the most, up 41 cents/gal from last week. Prices also increased in the Central Atlantic and New England regions, up 37 cents/gal and 36 cents/gal, respectively, from last week. The Gulf Coast also saw higher gasoline prices, increasing by 35 cents/gal since last week. Texas and Florida, in particular, saw increases of 40 cents/gal. 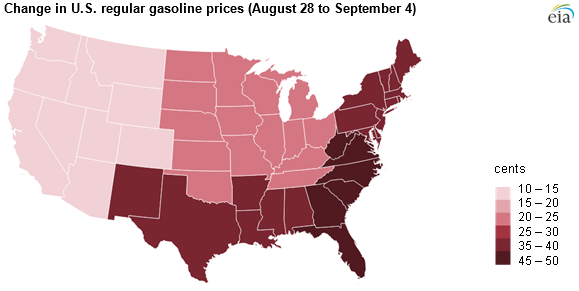 Gasoline prices in Houston, Miami, New York City, and Boston were up at least 35 cents/gal. Note: Day 0 indicates the day the hurricane made landfall in the United States. If landfall was on a non-trading day, the first trading day prior to landfall was assumed to be day 0. Prices are for Gulf Coast conventional gasoline. 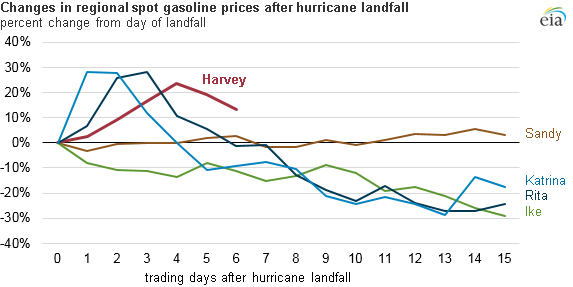 Compared with other hurricanes that have made landfall in the United States since 2000, Hurricane Harvey’s impact on U.S. Gulf Coast spot gasoline prices has been on par with the impact from Hurricanes Katrina and Rita. In August 2005, gasoline spot prices rose nearly 30% within one trading day after the landfall of Hurricane Katrina in Louisiana. The gasoline spot price remained elevated for a second trading day before rapidly declining soon after. In September 2005, prices rose by almost 30% within three trading days after the landfall of Hurricane Rita before similarly declining. In contrast, gasoline spot prices remained stable or fell in the days after Hurricane Sandy, which hit the U.S. East Coast, and Hurricane Ike made landfall. Hurricane Harvey’s impact on gasoline prices was more gradual than the impact following Hurricanes Katrina and Rita had because refineries in Houston, Texas, and Port Arthur, Texas, began going offline in the days after the hurricane’s landfall near Corpus Christi. As a result, gasoline prices rose steadily for four trading days before starting to decline. Several Gulf Coast refineries affected by the hurricane have restarted and some are running at reduced rates after being shut down during the storm; however, several refineries remain shut down. Colonial Pipeline, a major pipeline system supplying petroleum products from the Gulf Coast to the East Coast, restarted its Line 2 pipeline on Monday and its Line 1 pipeline on Tuesday.